Preheat broiler with a rack 6-inches from the top. Cut a "V" shape or triangle out of the top of the buns, this is a far more effective way to fill your sub than just a traditional lengthwise slice, which can be too tight to hold the filling. 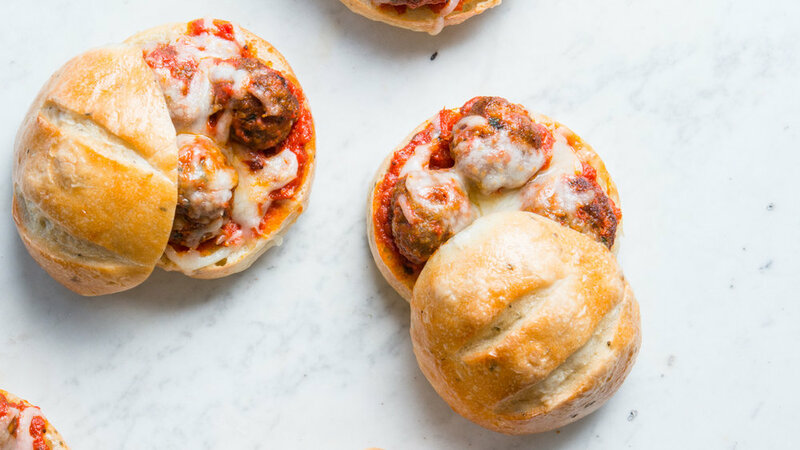 Spread some Spicy Tomato 'Nduja onto the freshly cut buns, enough to be generous without completely soaking the bun, then nestle in your meatballs. 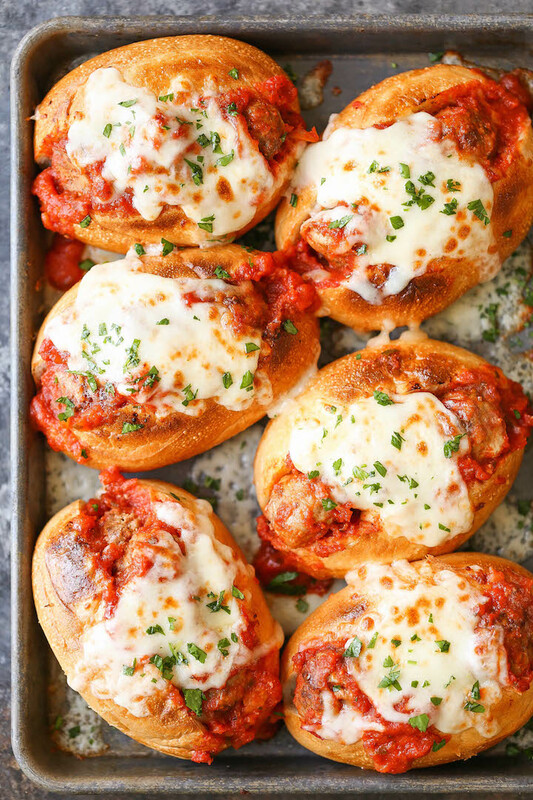 Add the shredded mozzarella between each meatball and over the top, then place under the broiler for 4-6 minutes or until mozzarella has melted. Sprinkle with a finish of reserved parsley and serve. Place bottom halves of sliders on a baking sheet. Top with 3 meatballs and sprinkle with cheese. Broil until cheese is melted. Remove the baking sheet from the oven, and top with remaining sliders. Broil an additional 2 minutes, to heat bread through. To toast the bread: Preheat the oven to 400º. Slice each piece in half. Drizzle each half with olive oil and spread with butter. Toast for 8 to 10 minutes until golden brown. Remove from the oven and while still hot, rub the cut side of the garlic over each top and bottom half of bread. Season with black pepper. Set aside. To make the spaghetti: Bring a large pot of salted water to a boil over high heat. Add the spaghetti and cook for 8 to 10 minutes until al dente. Drain in a colander and return the pasta to the pot. Pour 2 cups of tomato sauce over the spaghetti and toss to combine. Reserve the remaining sauce. Cover to keep warm. To assemble: Twirl 3 small scoops of spaghetti onto the bottom half of toasted bread. Top each mound with a meatball. Top each meatball with a spoonful of Spicy Tomato 'Nduja. Cover with 3 slices of provolone cheese and basil. Drizzle with olive oil. Bake for 3-5 minutes until the cheese is melted. Remove from the oven. Garnish with basil leaves. Fold the top half over to cover. Insert toothpicks if necessary to keep the sandwiches intact. Enjoy. In a large bowl, toss the roasted vegetables with 2 tablespoons (or more, depending on the desired heat level) of Spicy Tomato 'Nduja and a good splash of olive oil. Fill each roll with the vegetables. Enjoy! Place dinner rolls in a single layer onto the prepared baking sheet. Place meatballs into rolls, about 3 per roll; top with cheeses. Place into oven and bake until the cheeses have melted, about 3-4 minutes.